. 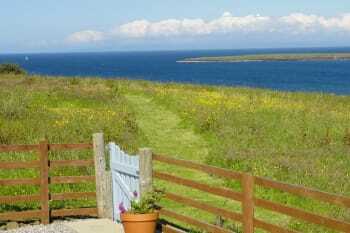 Spectacular views across the sea to mainland Scotland. . Superb location – close to Quiriang Mountain range, old man of storr, . 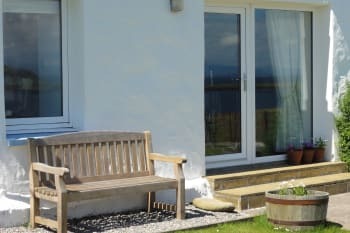 Kilt Rock, Lealt Falls Viewing platform, Fairy Glen, Dinosaur footprints at both Staffin beach & brothers point, Staffin Dinosaur Museum & Uig. . 2 bedrooms, sleeps 4 . More living space - 88 Square Metres (920 Sq Ft.) . Private Garden . Large fully equipped kitchen . Separate Living room with flat screen smart TV . Dishwasher . Linen provided . Towels provided . Washing machine and tumble dryer . Free Wi Fi . Free Private parking Driftwood Cottage is a detached former Blackhouse built in 1890, recently renovated to a modern standard, providing Self catering for 4 persons in 2 bedrooms. 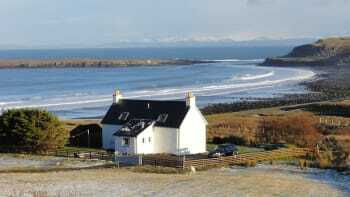 The cottage occupies a stunning hillside location above Staffin Bay with spectacular views across the sea to mainland Scotland. 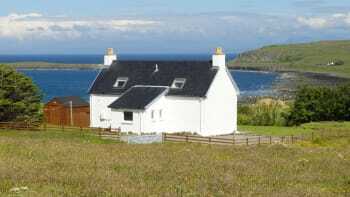 Situated in the crofting village of Staffin just 25 minutes from Portree. There are no rooms available at Driftwood Cottage for these dates. Superb Cottage! Perfect home for a holiday! The views are stunning! Simply fantastic! We couldn't have asked for a better place to stay during our trip to Skye. The cottage was immaculate and more than we could've asked for. The handbook was clear at explaining information about the cottage and also very helpful in noting ideas for places to visit, etc. We have absolutely no bad comments about this cottage and would recommend to anyone and everyone! The best thing to do, I think, would be to drive a car around the isle and discover everything Skye has to offer for yourself. The Old Man of Storr is also a must see, especially if you have great weather! Lovely Cottage away from civilisation; a perfect escape :) Very clean and tidy filled with everything you might need for the stay. No edible essentials at all so best to stop in Staffin on the way up and grab the essentials. This is a fantastic cottage with a modern kitchen and a very comfortable bed that is conveniently located close to the Quiraing, Kilt Rock and the Old Man of Storr. It is also a short walk from a nice little beach. I highly recommend Driftwood Cottage. Hike at the Quiraing, the Old Man of Storr and the fairy pools. we loved the place and the location, we d love to come back and stay longer. Quiraing walk. The isle of Skye baking company in Portree. The oyster shed. Very nice cottage with all you need and a wonderful view to the sea. The position of hair dryer and do not use the destination navigation given by booking app through google maps. Please use apple maps. Driftwood is cozy, comfortable, tasteful, very well equipped. You feel home immediately. Skye pie café. 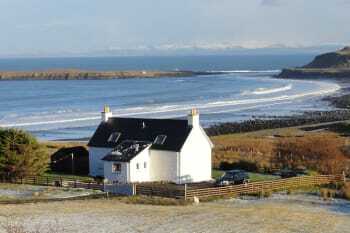 Walk to the tip of Trotternish an observe mink whales and giant sharks. What a beautiful setting and adorable cottage! Only wish we could have stayed longer! We enjoyed or stay very much, everything was fine. However, the price was a bit high for two days... Why a 4 for service/staff: is just, because I like to meet my opposite... information about the cottage and infrastructure around was top! Beautiful Cottage, finely furnished and equipped. Brilliant location. We definitely plan to return. Isle of Sky is not to be missed. Very nice and comfortable cottage in a quiet place. From the Cottage you have an amazing sight to the sea. It`s very clean and cosy. We felt very good during our stay. 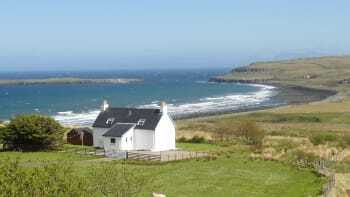 Beautifully located cottage with nothing between it and Staffin bay below. 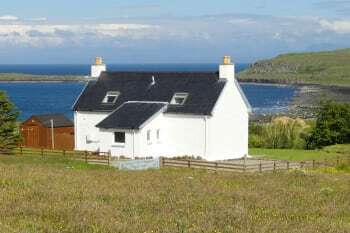 If you want to avoid the hustle and bustle of Portree and experience the peace of this less frequented part of Skye you’ll love Driftwood cottage. It’s exactly as per the pictures on their website. If you have the good weather we did you’ll love the outdoor seating and trestle table for meals/relaxing with a bottle and looking direct out to sea and across to the mainland. The cottage is situated about 30 minutes North of Portree and we’ll located for the Quiraing, old Man of Storr and Kilt Rock. There are a couple of general stores in staffin but Portree is the best bet for food shopping. The large Co-op located just on the outskirts of Portree on the Dunvegan Road is a better bet than the smaller one that you’ll find in town. No problems with parking either! Bear in mind the cottage only offers a small supply of coffee, tea and sugar (no milk, bread, cooking oil etc) so bear that in mind when planning what to bring/buy en route. Owners are readily available if needed else you have total privacy. Do try the Lochbay restaurant in Stein. Open for lunch and dinner with reasonable prices for a fine dining place. Booking is essential as it only has 18 covers or so and was full when we ate their for a mid week lunch with walk-ins being turned away. You can finder cheaper places to stay without a doubt but the the space, peace, privacy and fantastic views make the added expense worthwhile. Your Cottage is very nice,we enjoyed every moment. The view to the sea was great, sometimes a little rabbits visited us:-) Please keep your Cottage in this way it is really a beautiful house! Old Man of Storr nur only very early in the Morning of you want to be only by yourself wirhout a lot of ihrer people. Old Bridge of Sligachan. The cottage was modern, bright, and clean. Truly enjoyed the space. We appreciated the information book that was left for us. It was very helpful. The directions sent beforehand were very clear. Skye Pie Cafe was only ten minutes away, and was a great place for a bite to eat. They also have a small supply of local yarn for sale. Lovely cottage in a great location with a wonderful view of the sea . Everything was provided that we needed . The cottage was spotless and very well maintained . I would definitely stay here again when I next visit Skye . Very nice and clean cottage. Nice vieuw at all sites. Super ! Restaurants in Portree, also pubs and café's. Hotel Flodygarry, very good to eat, with a nice vieuw. But no signes for walks. The man of Storr,very nice. Other things to see, but by car. Lovely island. Driftwood cottage is in an idyllic location. With views out to the ocean and surrounded by countryside. Everything you need during your stay is catered for at the cottage. Easy to book and great directions/instructions from the owners. 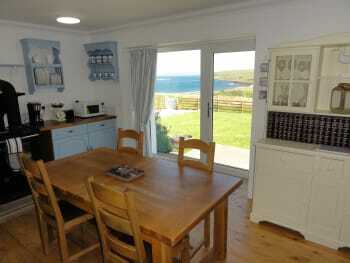 I have no hesitation in recommending Driftwood Cottage. The fossil museum and Kilt Rock are close by and definitely worth visiting. You must visit Staffin beach, near Staffin slipway, just a few minutes drive away. Best to go when the tide is out in the hope of being able to see the dinosaur footprints. There is a local shop and tea room in Staffin and Portree has lots of places to eat and shops to browse. This is such a wonderfull place to stay! The house is perfect and the views are amazing. The Beach is only a 10 minute walk away. We really were sad that we already had to leave and will be back for a longen stay in the future! Thank you very much!! We loved the walk to the Beach from the house. Skye is beautifull! Best location for exploring Skye. Very nice well-equiped home with fantastic setting and view. Driftwood Cottage could not have been more perfect! It is well positioned to explore Skye and major sites (30min from Portree, and 1hr from Carbost area). The cottage itself is immaculate and beautifully designed, with incredible views of the ocean to one side and the mountains to the other. It was so perfect that we didn’t want to leave! 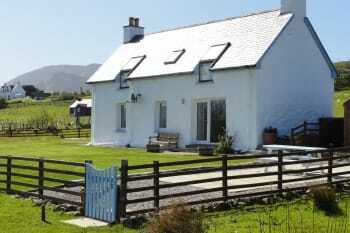 The cottage is well situated to the rest of Skye. We highly recommend driving north of the cottage along the Trotternish Pennisula for absolutely unreal views. The Staffin village store has quite a selection of goods or the CoOp in Portree is open until 10pm. Drive to Uig Harbor across the Quiraing (during daylight hours!) for views out of this world and a delicious dinner at the Ferry Inn in Uig. Driftwood Cottage was perfect for our stay on Skye. Spotlessly clean and very comfortable with great views. We thoroughly enjoyed our stay and would definitely return and recommend to others. Fabulous stay; extremely comfortable, well appointed, feel good home. Gorgeous views from every aspect. Great location. Loved how light the house felt, even when dismal weather outside! Beautifully dark at night with the black out blinds in bedrooms. Lovely and cosy, the Rayburn is wonderfully efficient! Would love to return and certainly recommend to others. Two village shops; only used the Mace during our short stay; this is well stocked and staff were friendly. Cottage in a great spot for visiting tourist spots in the north, great walking country. Fantastic property in a perfect location. Very family friendly, clean, and cozy. I've already recommended the cottage to other families looking to stay on the Isle of Skye. Loved our stay here wish it had been longer as we did not want to leave. View from property is incredible and can walk to beach. It is our new happy place on earth! Book longer stay. Nice drive north, great scenery, and we stopped for lunch at the Flodigarry restaurant. Food was excellent. Beautyful place to stay. Very lovely styleful cottage white a gourgeous vieuw! Driftwood Cottage was the most tasteful, best equipped cottage we've stayed in yet. The location (10 minutes from the beach) is fabulous. The cottage has an amazing location with a wonderful view. It is very comfortable and clean. Everything needed was available. The driftwood cottage is just a little piece of heaven. Everything is so perfectly set from the location of the house to room furniture. View of sea from the bedroom is so amazing. My stay was so nice that I was little sad while leaving. I would certainly come back to this cottage frequently! And we all loved Sally's flapjacks ;) Thanks for that sugary treat!